Did you know that in 2015, more than $180 billion were spent on marketing in the United States? But why? Because companies know that there is a hidden gold mine in the business of persuasion. Whether you’re a student, a professional, or an entrepreneur, persuasive skills will help you at some point in your life. You might use this knowledge to write the perfect scholarship essay, ask your boss for a raise, or negotiate a lucrative business deal. This book digs into people and dissects their decision-making process in a charming way. 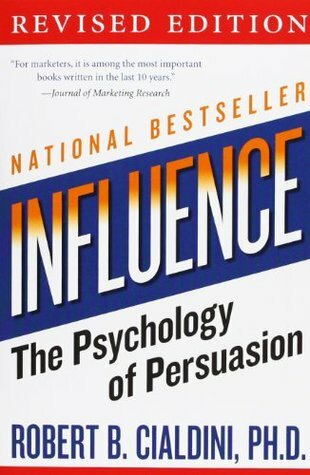 Influence explains exactly what you need to do to persuade others and even YOURSELF—sometimes you just need to convince yourself that you can do something. You’ll learn the fundamentals of habits, creativity, mental toughness, confidence, and, of course, negotiations. This book gives you a tool to hack into your own brain and reprogram it for success. The best part about the habit ideas in this book is that you don’t need to spend money or even face fearful situations to implement them. The ideas are based on simple psychological tricks such as writing on paper to enforce commitment. However simple, the ideas listed form the foundation of marketing and persuasion in the real world. His books including, Influence: Science & Practice, are the results of years of study into the reasons why people comply with requests in business settings. Reduce the number of decisions you make every day. To network with people, provide them with value. Always write down your goals on paper to solidify your commitment. Always work on things that matter to you and not to impress others. To know whether you’re on the right path, ask yourself if you’d make the same choice again. Put actions behind your words.